Forty Hall was built between 1629 and 1632 for Nicholas Rainton, a wealthy London haberdasher and Lord Mayor of London from 1632 to 1633. He was knighted in 1633 and in 1634 he was made President of St Bartholomew’s Hospital, which position he held until his death in 1646. In 1640 he refused to lend money to Charles I and also refused to supply details of the wealth of his associates when requested to do so by the Crown. He was subsequently imprisoned, taken to Marshalsea and moved to the Tower of London with four other Alderman. Five days later he was released due to public demonstrations. Sir Nicholas died in 1646 aged 77 and was buried at St Andrew’s Church in Enfield. The hall then passed to his son, also Nicholas. He was able to extend the estate northwards by buying and demolishing the neighbouring Tudor Elsyng Palace in 1656. In 1696 the hall passed to John Wolstenholme, who carried out major refurbishment possibly following a fire, including construction of an extension to the south-west, and planted the avenue. In 1740 the house passed to Eliab Breton, who remodelled the ground floor. Later owners included Edmund Armstrong and James Meyer, whose family built the nearby Jesus church in 1835. In 1894 the hall was bought by Henry Carrington Bowles of neighbouring Myddelton House for his son Major Henry Ferryman Bowles, MP for Enfield and later 1st Baronet Bowles. In 1897 there were further changes including enlargement of the south-west wing. In 1951 the Bowles family sold it to the Municipal Borough of Enfield, the predecessor of the London Borough of Enfield. 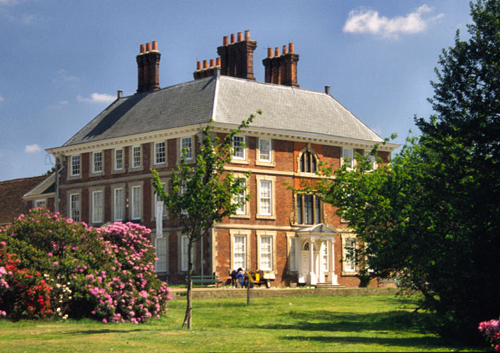 Forty Hall is currently being refurbished and will reopen as a museum. Having had an analysis of the paint carried out, I was asked for advice on the type of paints that should be used to help to recreate the scheme that existed in the 1740s. Not only did the finishes need to resemble the earlier ones, but they also had to be sufficiently robust to cope with visitor traffic. At the same time the paints had to be colour-matched to the samples produced by the paint analyst. This was done using a spectrophotometer. Each colour has been formulated and given a unique code so that further paint can be made up in the future. This is something that Papers and Paints specialise in. Bizarre that it might seem, all too often a contractor is handed the report produced by a paint analyst and he is asked to find colours that match. Having spent the time, effort and money in identifying an earlier decorative scheme it is essential that the paint finally selected matches the colours found. The fact that the contractor might refer to a ‘Heritage’ paint range is not good enough. Whilst on this hobby horse. I am also somewhat cynical of those paint reports where the analyst has cited the nearest Munsell reference, or the nearest NCS number. The former is seldom used in the UK and when used in the USA the analyst invariably quotes the nearest whole number (i.e. that for which a colour sample is supplied in the Munsell Book of Color. The same can be said for the NCS system, where the analyst might be using a proprietary colour chart/fandeck, which only has a limited colour range (albeit 1,000+ colours). The cost of these colour standards usually means that the originals are seldom employed. It is far better to include a colour sample that has been matched to the relevant colour and, ideally, this should be measured with a spectrophotometer and exact Munsell, NCS and CIE L*a*b* references given. In the two years since the above paragraphs were written I have been sent another paint report for a major house which suggests that Robert Adam used NCS colours exactly as found on the colour cards. How wonderfully considerate of him as it means that one need look no further than a high street paint range (forgive the deep cynicism). I wonder if you are talking about the Bowles family coat of arms, which is Azure three standing bowls argent, out of each bowl issuing a boar’s head or. Henry Ferryman Bowles bought the house in 1895.